Pumpkinseeds are one of many members of the sunfish family (Centrarchidae) that are frequently encountered by anglers over a broad swath of North America. Often mistaken for bluegills, pumpkinseeds (Lepomis gibbosus) have several distinguishing features, notably a dash of crimson on the ear tab that is typically less pronounced than on redear sunfish. Some of the confusion with bluegills stems from natural hybridization between panfish species, making identification difficult. Spawning typically occurs in late spring and early summer at water temperatures between 55°F and 65°F. Like other centrarchids, males build nests in shallow water. Females don't participate in nest building or defense. Solitary nests are common, but loose groups of 5 to 15 nests can be found in areas of favorable habitat. These aggregations typically are smaller and less dense than bluegill spawning colonies. 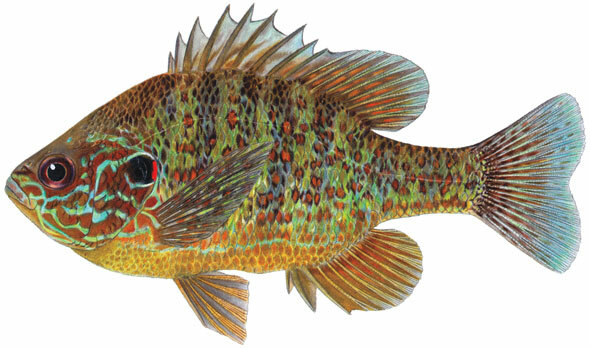 Pumpkinseeds and bluegills are often seen nesting within the same area, facilitating hybridization. Male pumpkinseeds exhibit a dazzling array of colors during the spawning period, making them one the most visually striking of North America's freshwater fishes. Not all males that build a nest successfully attract a mate. The red color on the ear tab is prominent on dominant males, and the size and color intensity of the ear tab likely plays important roles in establishing territory, and attracting a cooperative female that deposits eggs in the nest. Pumpkinseeds are opportunistic and eat a variety of small insects, crayfish, fish, and zooplankton. A specialized set of pharyngeal teeth allows them to crush the shells of snails and mussels. They are typically found around stands of aquatic plants throughout most of the year. Areas of bulrush sprinkled with pockets of coontail and pondweeds often hold large numbers during summer. While larger bluegills may move out to deeper habitats with less vegetation after spawning, large pumpkinseeds often linger in the salad, even under the ice. However, food availability strongly influences habitat selection. Feeding can be competitive during summer, and larger fish that have a lower risk of predation may venture outside the weededge. In some populations, pumpkinseeds rarely surpass 7-inches, while others consistently produce bull specimens. Growing an 8-inch fish might take nearly a decade in some waters. Although little has been studied about the effects of angler harvest on pumpkinseeds, systems that consistently produce large fish are comparatively rare, suggesting that harvest can reduce fishing quality, especially at northern latitudes where growth rates are slow. Most fishery agencies make no distinction among sunfish species when implementing harvest regulations, so bag limits are set for sunfish as a group. Regulations remain liberal — daily bag limits of 10 fish or more per angler in most jurisdictions — are common. Releasing the largest pumpkinseeds is a wise step towards ensuring quality fishing. Male pumpkinseeds are aggressive when guarding nests and readily take small jigs and livebaits in their vicinity. They also attack larger offerings that are perceived as a threat. Larger baits help to selectively target bigger fish, especially where smaller sunfish are abundant and annoying. Due to the sporadic distribution of nests, it's often best to be mobile to contact large numbers of fish, and sight-fishing is productive when water clarity permits. Most pumpkinseeds prefer to spawn over clean substrates of sandy gravel, but nesting males may be more tolerant of vegetation than bluegills, so also look for nests scattered along inside weededges. Long telescoping rods are effective for dabbling small jigs (1/64- to 1/32-ounce) in front of individual males, or in areas where fish are abundant. Dress jigs with crappie-sized softbaits or a chunk of nightcrawler. Two-inch curlytail grubs and small tubes are good options. A slipfloat rig is hard to beat when nests are scattered, or during periods just before nesting when fish are roaming the shallows. Mini crankbaits are top bets when fish are scattered. You might also try 2- to 3-inch fathead minnows freelined around loose concentrations of nests. Some of the largest male pumpkinseeds I caught last year came on this presentation. It also kept puny seeds at bay. Dr. Daniel Isermann, frequent contributor to In-Fisherman publications, is an assistant professor of fisheries at the University of Wisconsin-Stevens Point.